Trump’s election is an equivocal ‘victory for white supremacy’, and justified cause for fear to circulate among people of Colour living in Anglo-dominated nations. Yet history has seen other global upsurges in nationalist white supremacism, other times when fear and hope have made strange but productive bedfellows. The 19th Century was the trans-imperial ‘age of mobility’. And it saw Melbourne become home to heterogeneous populations. By the time the Australian colonies united as a ‘white nation’ in 1901, a long history of migration connected Melbourne with global locales, from Punjab to Karachi, Canton to Hong Kong, Leicester to Oslo. Not only did Chinese migrants spread from southern provinces of Canton across the Pacific Rim, but so too did Indians, Afghans and Syrians migrate across borders internal to what is today known as South Asia. This included those highly permeable borders that demarcated Syria (part of the Ottoman Empire), the Emirate of Afghanistan (a buffer between the Russian and British Empires) and India (part of the British Empire). Many also ended up in Melbourne, the capital city of the Australian colony of Victoria. In December 1901, almost a year after Australian national consolidation, the Immigration Restriction Act (IRA) was the seventeenth act passed by the new Federal Parliament of Australia at the European-sated and hill-elevated end of Spring Street, in the nascent capital that was Melbourne. The IRA saw the introduction of a Dictation Test where a prospective ‘undesirable immigrant’ could be asked to dictate fifty words in ‘any European language’, chosen at the discretion of the customs officer. The test was a quasi a-racial way to exclude people designated ‘Asiatic’ (a grossly generic category that covered people born in China, India, Afghanistan and Syrian, current day Lebanon) from the space of the imagined white Australian nation. 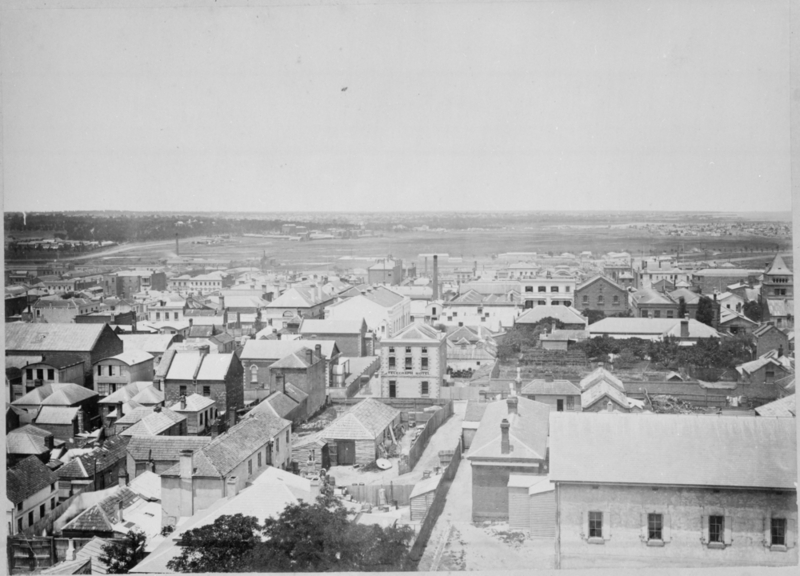 In 1901, Melbourne was home to thousands of residents of Colour, and white settlers hoped that the deployment of the IRA would see to it that Melbourne would transit from a multi-racial colonial metropolis into a purely white national space. Melbourne’s transition to national capital was part of a broader, global transition, where nationalisms were budding in a world of overlapping European and Asian empires, and the United States and the British dominions were sharing a vision of cementing white national belonging and drawing a ‘global colour line’. Given the years of effort and negotiation it had taken white settlers in Australia to find a way to mitigate Coloured immigration in ways permissible to the sensibilities of the British metropole, one might expect that the IRA delivered to white settlers catharsis en masse: that they would ooze relief and self-satisfaction in the years post-Federation. Recent reading and research has proved this assumption wrong. The IRA may have been a legislative triumph of white supremacist laws over (the pretenses of) British equality, but it was not simply that. It also forced white Australians to confront the fact of their dependence on Coloured traders and markets and, relatedly, to admit their unhappiness. A Tasmanian newspaper ran an article in 1903 subtitled ‘A Drab Coloured Australia’. It expressed the failure of Australians to achieve happiness through national independence. ‘We have the freedom of independent states [and] … human happiness ought to come into blossom on Australian soil’, it told, ‘yet … Australians at the present moment are … the less contented patch of humanity within the bounds of the British Empire’. White Australian control, told such reports, should be more secure than ever, but instead it felt acutely uncertain. People of Colour in a nascently federated ‘White Australia’ occupied a tenuous position. They were rightly fearful of discrimination, white social violence, and deportation. At the same time, spokesmen of Colour were aware of the self-defeating project of white supremacist independence. In Melbourne, Chinese and Indian leaders, including missionary Cheok Cheong Hong and masseur Teepoo Hall, called attention to white settlers’ dependency on the labour and services of people of Colour close to home, and on the markets of Asian nations overseas. As the Reverend James Cheong glibly argued in 1909: ‘what would we in Australia do for vegetables if it were not for the Chinese?’ These and other leaders called attention to the impossibility of white economic independence as a rationale for loosening the restrictions on Coloured mobility wrought by the IRA. But resistance to white supremacy and, by the same token, to the IRA were not the only form of Coloured mobilization in the early years of the 20th Century. At the same time, Indian and Chinese nationalist movements were growing in the homelands and in diasporic communities, from South Africa to Canada, England to Australia. For example, Sydney-based historian Kama Maclean has recently shown that Australian and Indian nationalist movements were connected in surprising ways. Indeed, in the early years of the IRA, the nationalist hopes of Indian British subjects were registered in Melbourne. Since the arrival of Chinese to inner Melbourne en masse in the late 1850s, white outsiders to inner Melbourne’s Coloured zone had treated it as a fear-provoking ‘slum’, replete with crime, immorality, poverty and and ‘problem’ mixed-race children. In the early years of the IRA, journalists began to recognise that the Chinese Quarter was more bustling than ever and that the area around Little Lonsdale Street was a not just a slum. Ebenezer and David Syme, 1863. Melbourne’s so-called ‘slum’ streets were a veritable hotbed of political activity, not least of a growing Indian nationalist movement, and the Exhibition Street pawn shop run by the prominent India-born merchant Khooda Bux was a significant ‘headquarters’. A 1904 Geelong Advertiser article on Melbourne reported that: ‘The Hindus have dreams of self-government in India, and they fully expect it in their own time … and when it arrives the brown citizens of Little Lonsdale Street promise the hottest retaliation, and the war cry of a “White Australia” will be met with that of “Brown India’. 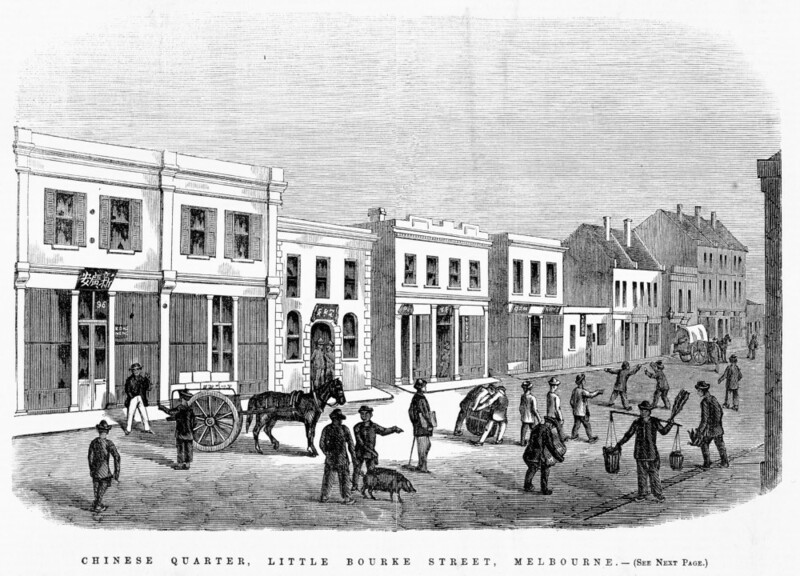 Faced with the striking synergies of Australian and Indian independence, Little Lonsdale Street could no longer be dismissed as a mere slum. It was a political center unto itself, stirred by the unlikely synergies between white Australian independence and the rising passions of Indian nationalism. 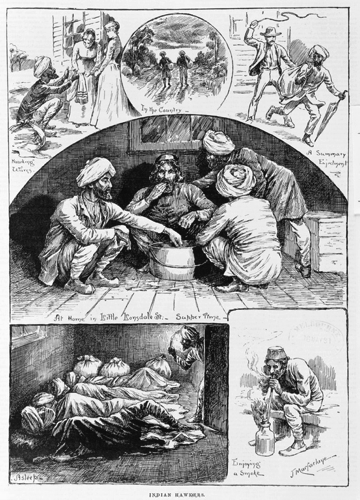 Reference to Little Lon as a diasporic hub can be seen in the centre caption of ‘Indian Hawkers’, Melbourne: David Syme and Co. 1891. Nationalist passions were not confined to the shops and boarding houses of ‘slum’ Melbourne, but were taking political expression in anti-white settler supremacy and anti-imperial boycott movements across the globe, and not least potently boycott movements linked to the Swadeshi movement, triggered in 1904 by the British move to partition Bengal from India. News about the IRA quickly reached the ears of nationalist traders in India who’d previously bought Australian goods to sell to Indian markets. In 1905 the Melbourne Age reported that ‘a story is now in circulation about a huge shipment of Australian butter which was rejected by patriotic Indian merchants in Colombo, who were determined to have nothing to do with the Australian produce so long as the Alien Restriction Act prevented their black brothers and sisters from settling in Australia.’ The immigration restriction policies of British settler colonies, so Maclean has told, were not simply oppressive but ‘inadvertently provided material for Indian nationalists, adding to their expanding critique of imperial politics’. It’s been almost 115 years since Australia procured legislative status as a ‘White nation’, but the lessons remain germane. Early-20th-century Melbourne history reminds us that the affects of governmental sanctioned white supremacism are not pre-determined, nor do they readily produce victims. Rather, this history begs a question that numerous commentators have been posing: what unexpected upshots of white supremacism will unfold? What movements will it interact with, unleash, and energise? For white supremacism such as that palpable in Brexit and in Trump’s election is circulating around Australia, and the supposedly cosmopolitan city of Melbourne is by no means immune. Now, Asian Australians in Melbourne are debating and dancing, singing and mobilising for many and autonomous reasons, and not least to counter with renewed if tired urgency the white supremacism that’s been empowered via Pauline Hanson’s re-entry into Federal Parliament this year. Asian Australians, may I say as a beholden Anglo participant, are responding to white supremacism in style, and in definitively public spaces; between the colonial bricks of the Melbourne Immigration Museum, the lavishly wallpapered rooms of Melbourne University, in the Ramen bars of Lonsdale Street, and many more places beyond. See ‘1901 Immigration Restriction Act’, National Archives of Australia (NAA), accessed online 26 July 2014. See also Barry York, ‘Immigration Restriction, 1901-1957’, Studies in Australian Ethnic History, Volume 1, 1992. A Social Talk: A Drab Coloured Australia’, Examiner, Launceston, Tasmania, 10 October 1903, 9. Reverend James Cheong speaking near Mornington, ‘Chinese Civilisation’, The Newsletter: an Australian Paper for Australian People, 30 January 1909, 4. Kama Maclean, ‘Examinations, access, and inequity within the empire: Britain, Australia and India, 1890-1910’, Postcolonial Studies, 18(12), 2015, 128-9. ‘Hindus in Melbourne’, Geelong Advertiser, Victoria, 7 January 1904, 4. ‘Political Bias: The White Australia Bogey: Another Ridiculous Story’, The Age, 25 July 1905, 5. Kama Maclean, ‘Examinations, access, and inequity within the empire: Britain, Australia and India, 1890-1910’, Postcolonial Studies, 18 (12), 2015, 128-9. In September this year the Asian Australian Democracy Caucus held an inaugural event at the Immigration Museum called ‘More Than One Nation’, where they considered how Asian Australians might find ways both to counter the violent effects of Hansonism and to live and perform democratic conversations in ways that respect the sovereignty of Indigenous people in Australia.